The chipmaker's chief executive has witnessed the tech sector's boom and bust cycle firsthand. Facebook Inc. (FB - Get Report) , Amazon.com Inc. (AMZN - Get Report) , Netflix Inc. (NFLX - Get Report) and Alphabet Inc. (GOOGL - Get Report) -- collectively known as the FANG stocks -- have had a wild ride over the last several months. The tech sector slid to new lows in early June, thanks to some foreboding claims from investors who questioned whether the run-up in the first half of the year was reminiscent of the dot-com era. At the end of July, the sector shot back up as the S&P 500 Information Technology Index reached a new lifetime high, breaking a 17-year-old record set during the dot-com bubble in March 2000. Since then, the sector has been plagued with volatility. Analysts have been trying to get a handle on what's spurring tech's ups and downs. Some have attributed it to investors rotating out of growth sectors such as technology and into underperforming sectors like financials and energy, while others believe it may be the precursor to a wider stock market correction. Concerns about another tech bubble have largely dissolved, though some still remain cautious. 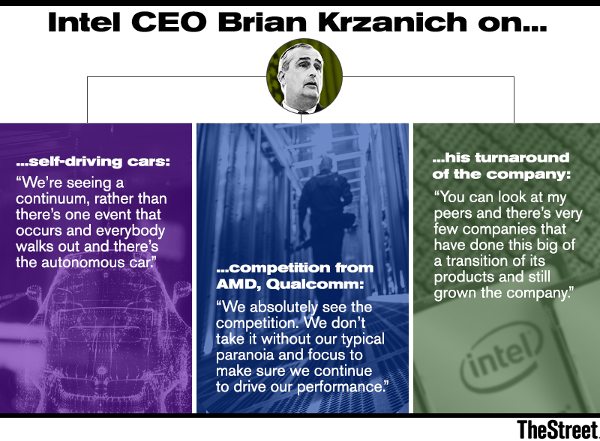 Intel Corp. (INTC - Get Report) CEO Brian Krzanich, who joined the company as an engineer in 1982 and became CEO in 2013, witnessed firsthand the boom and bust of the tech sector in the late 1990s and early 2000s. The chipmaker was a part of what some refer to as "The Power Five," or the dot-com era's version of the FANG stocks -- Intel, Microsoft, Cisco Systems Inc. (CSCO - Get Report) , Oracle Systems Inc. (ORCL - Get Report) and IBM (IBM - Get Report) . In August 2000, Intel was at its peak with a market value of $509 billion, making it the third-largest tech company in the world. Intel shed about $400 billion of its value after the bubble burst, however, and is now worth approximately $162 billion. Krzanich believes that a company's earnings are the best validation of its valuation -- meaning that if a company shows sustained profit growth, it can justify a higher price-to-earnings multiple, or P/E ratio. "When I look out at the market, where I worry about valuations is when I don't see those earnings substantiated behind a company's valuation," Krzanich said in an interview with TheStreet. "At the end of the day, [valuation] has to be based on a company's earnings." Analysts have pointed to companies such as Tesla Inc. (TSLA - Get Report) and Snap Inc. (SNAP - Get Report) that have attracted high-flying valuations while failing to generate a profit. Tesla, which is valued at roughly $57 billion, just posted its largest-ever loss in the second quarter. Tesla CEO Elon Musk even admitted that his company was overvalued, telling The Guardian that the electric car-maker's market cap is "higher than we have any right to deserve." Snap shares, meanwhile, continue to fall as the company struggles to meet aggressive growth expectations. "You have to make revenue, but more importantly you have to make profit off of that revenue," Krzanich explained. "And that's where I think when those things get out of alignment, that's when you get into trouble." Krzanich hesitated to prognosticate much further on the health of the stock market, saying he'd leave that to people like TheStreet's Jim Cramer, but noted that he feels confident in the value of his company's stock. "I look at Intel and I think we're not overvalued; in fact, I believe we're undervalued," Krzanich added. "Part of our thing has been showing people that we can continue to drive this earnings growth and that we're reliable. I think we are." Action Alerts PLUS , which Cramer manages as a charitable trust, is long GOOGL and FB.